To say that Arrow is a show about identity and morality is to say that the ocean is wet and the sky is up. It’s not a surprise to any of us when the show decides to send Oliver Queen headfirst into a moral dilemma or an identity crisis spiral. So what is it that makes “Disbanded” an actual refreshing episode of the series — even after I’ve spent five years with Oliver’s angst and darkness? Because it asks a different question and demands a new answer to an old problem. The problem in this episode is that Oliver is so beaten down that he’s out. He’s done. And not because he’s frustrated. And not because he’s scared. Because he’s been broken. It takes a lot to get people to push to their breaking point, but Adrian Chase managed to do that to Oliver. Luckily for him, there’s one person in his life who will never give up on him, and who sees him for the man he really is. And no, it’s not Felicity Smoak. This week’s episode, ultimately, was about the power of friendship. And though that sounds like a cheesy after-school special, friendships are really fundamental to us existing as human beings. Friends are there to pick you up when you’ve fallen, but are also there to deliver hard truths even when you don’t want to hear them. But more than just that, friendship is — at its core — incredibly powerful. The best friends are the ones who stick by you and won’t give up. Even when you’ve given up on yourself. Adrian broke Oliver, because he made him admit to the belief that his entire masked crusade was about killing, and that it was a façade for his thirst for blood. Normally, Oliver wouldn’t believe that sort of thing about himself (even if he does have the tendency to spiral and self-sabotage on a weekly basis). But because Adrian tortured him mentally and physically on every level, Oliver snapped and something within him just broke. 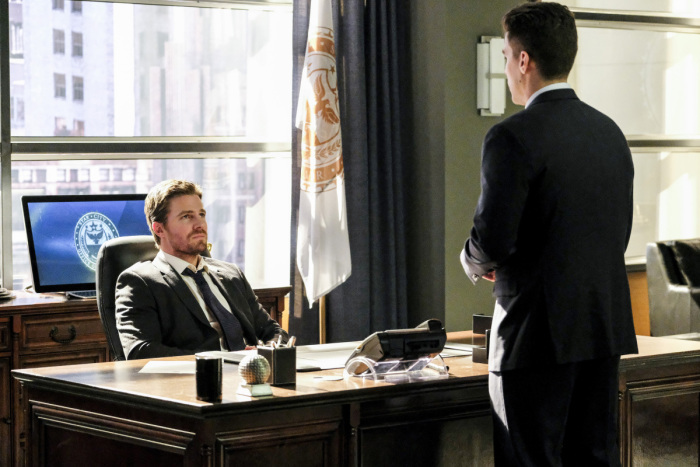 Even the way that Stephen Amell plays Oliver in this episode is different — he’s quiet, defeated, and just plain done with being around people or involved with them. He breaks up Team Arrow, breaks up with Susan (praise the Lord), and enlists the help of Anatoly and the Bratva to kill Adrian Chase. Suffice it to say, Oliver Queen is just done with being anyone or anything. At first, it doesn’t feel that out-of-character because we’ve watched Oliver play the defeatist card pretty frequently. This time, though, things feel different (and Felicity vocalizes that). That’s because they are. While Oliver has been defeated before, he’s never been broken. He’s never questioned who he was or his crusade, only others’ involvement in it. Even when he was ready to give himself up to Slade Wilson, Oliver didn’t question who he was. He just believed he deserved to pay a price for what had been done in the past. In some ways, Oliver still believes that in “Disbanded,” but it’s more than just that — it’s now that Oliver believes his best option for existence is to push everyone and everything away because his life and crusade have all been lies. He doesn’t believe he’s deserving to wear a mask or a hood anymore. And that’s the key difference, really, this time around. It’s not that Oliver doesn’t want to pick up that mantle; it’s that he doesn’t think he even should. He’s bought into the lie that all he is, at his core, is a liar and a murderer. It’s kind of painful when you really think about it, because Oliver already has self-sabotaging “the world is on my shoulders” tendencies to begin with. Couple those with intense self-doubt and you’ve got the makings of a shell of a person, rather than a whole one. It seems as if Oliver is just done — done with feeling, done with people, done with touching anyone else’s life. He mentions something to Susan which I thought was interesting, in spite of the fact that their whole relationship made no sense to me whatsoever: he tells her that this wasn’t how he wanted his life to touch hers. Oliver’s realized that his life has touched so many peoples’ lives, but Adrian has made him only see the pain he’s “caused”: the deaths of Moira and Tommy and Laurel. The demise of Evelyn. The destruction of Thea. He tells Diggle that it’s all his fault, and that he is the person who brought so much pain and darkness and death into the city and into the lives of others. He won’t do that anymore. He can’t. He just can’t. We need stubborn people and we need stubborn friends who speak life into our darkness and who pull us out of the pit when we cannot stand. After Diggle leads Team Arrow to thwart Anatoly and the Bratva’s plans, Oliver angrily confronts Diggle (and punches him!) and tells him, one more time, to back off. But Diggle won’t. He’s a soldier and he knows that whatever happened to Oliver is undoubtedly painful and incomprehensible. But he is not leaving a soldier behind. And even if Oliver can’t see who he is and who he was meant to be, that’s okay. Diggle can. Oliver confesses that he doesn’t feel like he’s ready or able to put on the hood again. He doesn’t feel worthy of it. And what Diggle says is something pretty profound: he says to earn the hood back. Atone for whatever wrongs he thinks he’s done or has actually done. But you can’t atone for a wrong if you ignore it and run away from it. For Oliver, his default mode will always be isolation. It’s the thing that drove him back to Lian-Yu after season one. When he feels at his lowest, he separates himself from the people he desperately needs to be around. Diggle gets this, and he knows that Oliver cannot be alone — that only leads to more issues. So Diggle’s solution is smart and solid. If you don’t feel worthy of something, you can’t just ignore it and remove yourself for it. You work to earn it. You work to be worthy. You fight and you keep fighting until there’s nothing left in you. And then you let other people fight for you. That’s what I loved about “Disbanded” and tweeted last night — Team Arrow will ALWAYS be Team Arrow, with or without Oliver. That’s what they’re all about: fighting against injustices and righting wrongs. Oliver set up a legacy in that regard. Whether he’s present or not, he’s inspired and influenced so many people to fight for the good guys. So Diggle takes up the mantle of team leader, and fights for Oliver’s soul when Oliver cannot anymore. Which brings us to our second explored friendship of the night: Anatoly and Oliver. Anatoly is such an interesting character. And even though I have not been paying attention to the flashbacks, I know this much to be true: he and Oliver needed each other. Oliver needed someone he could trust and Anatoly needed someone to keep him accountable and to make him a better person. When they were together, they didn’t always do the right thing, but Anatoly and Oliver made each other better. They encouraged one another. And when Oliver left, Anatoly vocalized the fact that he wasn’t worried about Oliver’s future — he was worried about what he would become without Oliver there to guide him. And as it turns out, Anatoly was right to be worried. When he returns to Star(ling) City, Oliver instructs him to kill Adrian Chase. Oliver doesn’t care about the cost of his soul anymore — all he cares about is Adrian Chase in the ground, no matter the cost. Better his soul than anyone else on Team Arrow (that’s his argument). But when Oliver is finally talked off the ledge by Diggle, he goes back on his promise to Anatoly — pharmaceuticals so that an insanely addictive drug can be made and Anatoly can financially save the Bratva — which, needless to say, causes a lot of friction between the two. Not only does Anatoly threaten Oliver’s team, but he also threatens to kill hostages if Oliver’s team doesn’t back down. That’s not the Anatoly we know. The Anatoly in the flashbacks had some moral gray areas but he and Oliver went on a heist to save a bunch of sick people in Russia. And now, Oliver is watching as the man who used to be his friend is threatening and blackmailing to get power. The two have a confrontation on a rooftop at the end of the episode, where Oliver says that he doesn’t know who Anatoly is anymore. The man he once knew would never have threatened the lives of innocent people to maintain his status in the Bratva. With tears in his eyes, Anatoly tells Oliver that what he said all those years ago remains true — he was worried about what he would become without Oliver’s influence, and look at what happened. I love the parallelism that we get in this episode — of what happens when you don’t have a person to guide you out of the darkness, and what happens when you do. Though I have hope that Anatoly’s soul is not doomed and there’s redemption for him, it was sad to see him so broken and so darkened. Oliver influences people, whether he realizes it or not. And sometimes NOT being around someone is just as big of an influence as staying. Overall, I’m actually pleased with this week’s episode. “Disbanded” gave us some really great Diggle/Oliver scenes that reminded me of why I liked this show in the first place. While Arrow is on hiatus for a few weeks, hopefully it’ll come back just as strong. The other story in this episode involved Curtis and Felicity on a heist! Long story short: there’s footage of Prometheus with his face pixelated. At Helix, Felicity realizes that she needs to unscramble the face. And to do that, she needs information that Curtis conveniently gets from Chase, thanks to his T-Sphere. Unfortunately, the scrambler is encrypted and it’ll take forever for Felicity to get it unencrypted. Luckily, our lovely Helix leader Kojo tells them that they should just go to the source and break into the lab that created it to unscramble the footage. After a few minor mishaps, the two manage to get the scrambler unencrypted and it reveals — as clear as day — that Adrian Chase is Prometheus. That’s all well and good, but Chase is being held in federal custody. And because he’s smart, he realizes when his guards get a phone alert, people have figured out his true identity. So he kills his two guards and manages to escape (in a scene that was actually really perfect and creepy because he drives off to “It’s A Beautiful Morning”) to places unknown. Ruh-roh. I’m kind of tired of Adrian Chase whispering all the time. Just do your evil monologues and threats at a normal talking level, dude. It’s taken me this long to realize that the actress who plays Kojo is the same one who played Marina in The Magicians. I loved Marina and now it makes me love Kojo even more. “John Diggle: my favorite American!” That’s how everyone should greet Diggle. What did you all think of this week’s episode? Sound off in the comments below and see you back here at the end of April for the next new episode!